Special Holiday Message from Carolyn Thompson - Thompson Law, P.C. Christmas Greetings! How I have missed you – my clients and friends – as I have been in Houston receiving cancer treatment. Whether I’ve had the opportunity to meet with you personally, or you’ve met with another Thompson Law attorney, you may have heard about my health journey this year. If you have a few minutes, please enjoy the attached video message that I am so excited to share about my return home to Sioux Falls. Even though I am doing very well medically-speaking, I do not have a timeline for my return to the office. For now, I am able to stay involved from the comfort of my own home. 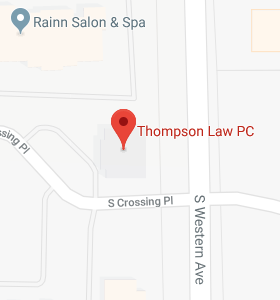 While I continue to focus on my health from home, I am so thankful to the attorneys and staff who are operating business as usual at Thompson Law. What a team I have been blessed with! Praying for a meaningful Christmas season for you and your loved ones. As I thank God for the many blessings in my life this year, please know that I count you within that number.